Further details: (A) Arctic Conditions, 2_11. Cold December 1938 and was El Niño involved? Bluethgen gives a detailed assessment of the severe December 1938 cold spell. This cold air from the ‘Petschora Basin (Pechorskaya Guba)’ seems to have had other causes than the emerging arctic conditions in December 1939. But even if they did not, this could be used as a contributing piece of evidence. The December 1938 event was short. Actually, the winter of 1938/39 was mild. 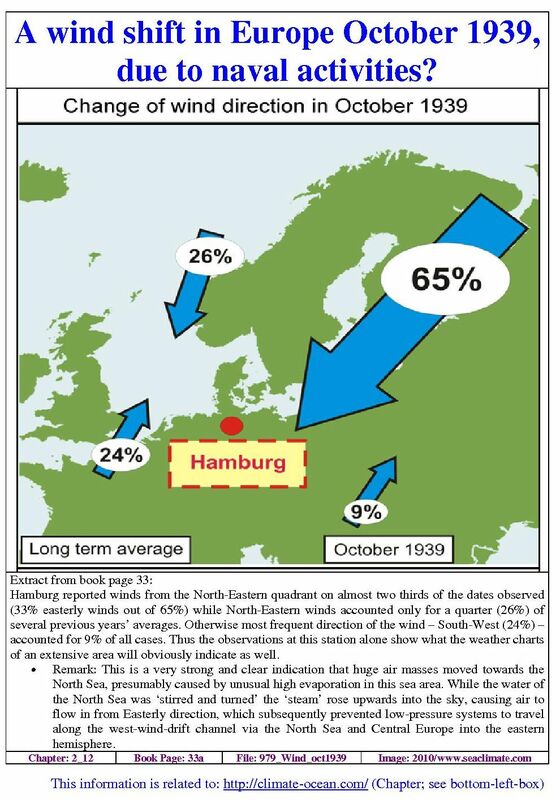 That a ‘repetition’ did not occur in December 1939 indicates that the underlying climatic conditions (North Sea and Baltic Sea) had changed within only three months of the start of war so much that the weather in Western and Northern Europe could not return to ‘normal’, viz previous winter conditions. Why back to the ice age in winter 1939/40? Further details: (A) North Sea cooling, 2_16, and Baltic Sea cooling, 2_17. *) German meteorologists prior WWII used the term ‘west wind drift’, a term which is today commonly used for Antarctic circumpolar wind and current. Further details: (A) Rain-Making, 2_31; USA dried out, 2_32, and War in China, 2_33. 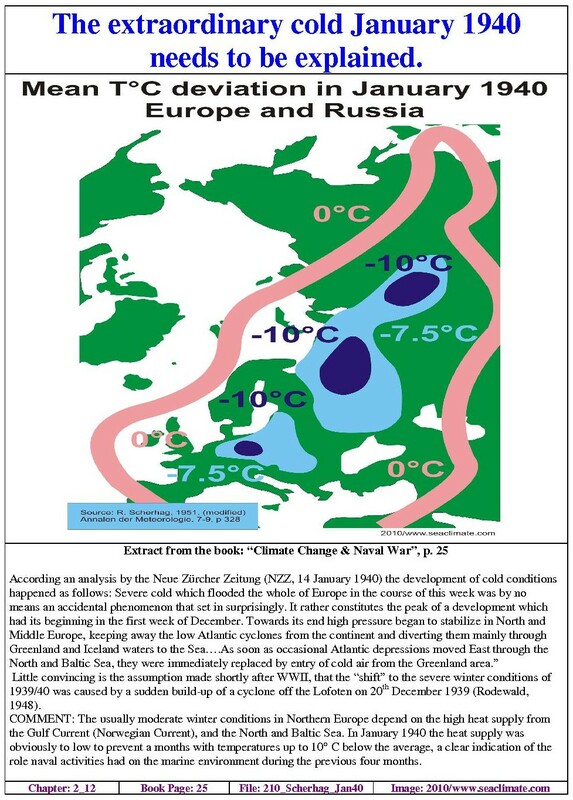 This chapter proposes to show that the meteorological developments since September 1939 indicate clearly that conditions of the North Sea helped pave the way for plunging North-Western Europe, from Southern England to the Baltic Countries into the coldest year since early 19th century. Military activities changed the seawater temperature structure of Europe’s northern seas, ‘forced’ humidity out of the atmosphere at the Western Front. This event did not disappear without leaving any traces. To prove this point the daily “weather analysis” reports of the Deutsche Seewarte, as part of the daily weather records, will be used to show that during the period from September to December 1939, there were indications that the weather in Middle Europe did not behave according to the ‘rules of average’. 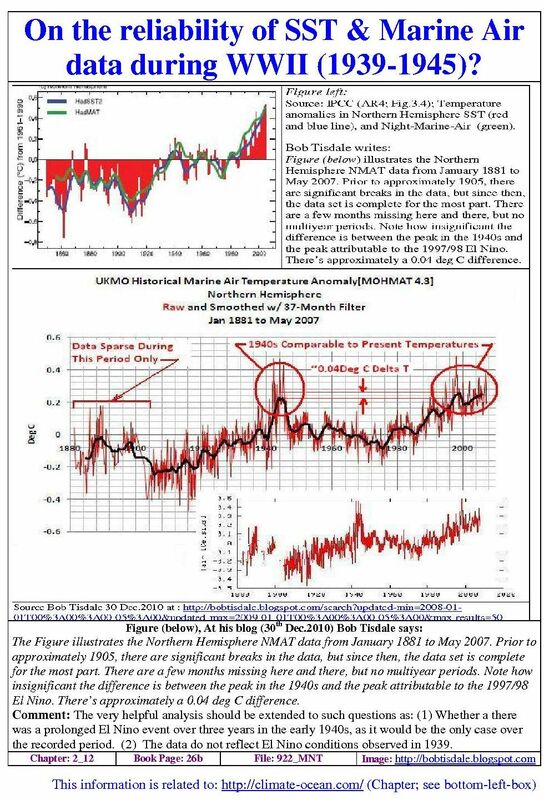 The aim is to adduce evidence to prove that this winter in question did not emerge ‘out of the blue’ but developed gradually and due to anthropogenic making. Little convincing is the assumption made shortly after WWII, that the “shift” to the severe winter conditions of 1939/40 was caused by a sudden build-up of a cyclone off the Lofoten on 20th December 1939. What role did El Niño play? 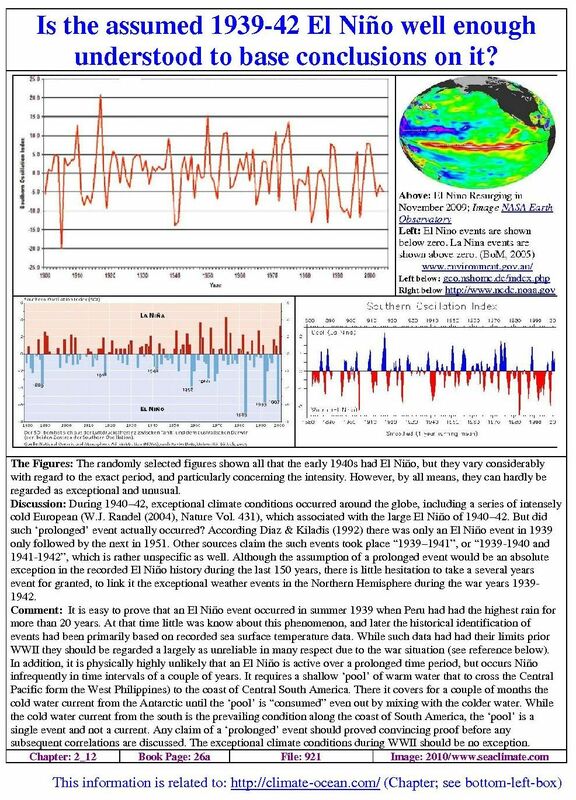 Although the scientific approach of this work is to elaborate historical data and views, an exception shall be made with regard to recently published articles concerning the long-distant effect of El Niño. Recently Stefan Broennimann and his colleagues inquired the causation of the extreme European winters 1940-42. We fully support the conclusion “that the global climate anomaly in 1940 to 1942 constitutes a key period for understanding of large scale climate variability”, but have reservations in following Broennimann et. al. linking the arctic war winters decisively to El Niño. As this is not the place to reply in detail, only a brief comment shall be given. It is a long established fact that El Niño events can be linked to unusual short-term weather deviations in distant regions, but Northern Europe is only remotely affected. During the last 150 years the Pacific Ocean experienced about 40 El Niño events. Some severe winters concede with events, some not (e.g. 1916/17, 1928/29). Nevertheless, modest influence cannot be denied outright. In July and August 1939 an El Niño event reached its height having caused the best vegetation in Peru for 14 years, but the 1939 El Niño was not particularly anomalous. In autumn 1939 the event had already reached the culminating point. 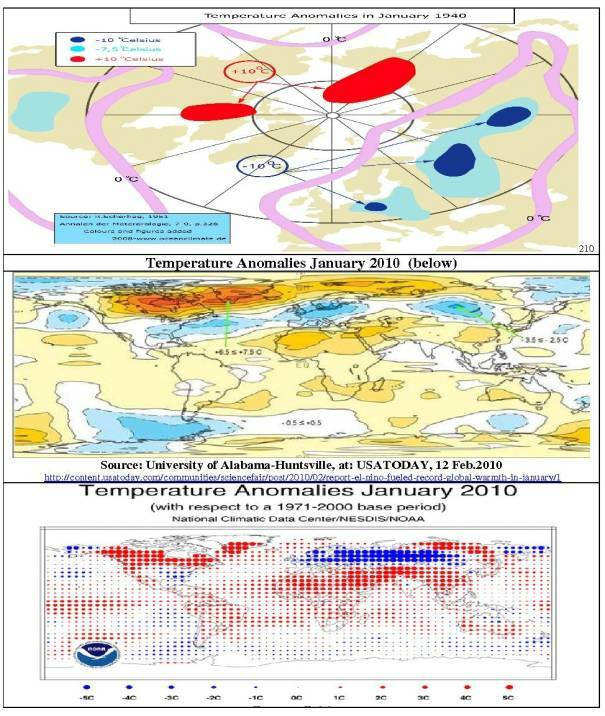 Frequently in 3 to 7 years interval, a warm water pool that causes the El Niño effect generates in the western Pacific north of Indonesia and moves along the Equator toward Central and South America. The moving time is about nine months, while Dake Chen et. al. concluded recently that the motion of the pool is causing changes in the atmosphere and not vice versa. Thus the brief cold spell in Northern Europe in December 1938 (see above) could possibly have been caused by a warm water pool that started to leave the western Pacific in late 1938 to become El Niño 1939 a couple of months later. in Europe lasting until March 1940, which is elaborated in more than a dozen following chapters. Further details: (A) USA dried out, 2_32. There are even less reasons to assume that the equatorial Pacific had anything to do with the 2nd and 3rd glacial war winter in Europe either. For long many scientists claim that there had been a prolonged El Niño lasting from 1939 to 1942. This has never convincingly been established. The Pacific does not provide the “physical conditions” – as explained in the previous paragraph- for a prolonged eastward flow of warm water. As far as observations between 1940 and 1942 might have indicated to El Niños actual causation might be quite different. The claim of prolonged El Niño condition is largely based on Sea Surface Temperature (SST). Due to the war conditions these data are not reliable, neither for the Pacific, nor for the North Atlantic. 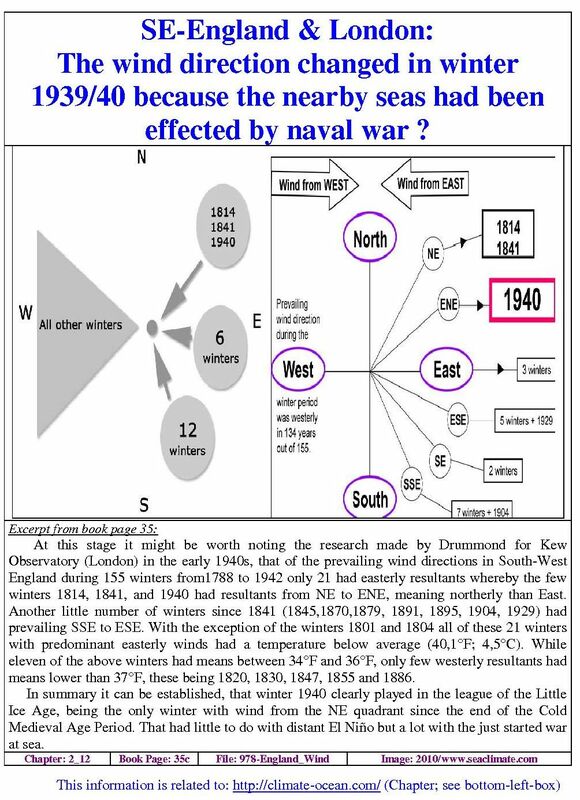 Furthermore should be considered that extreme weather conditions in Europe caused by cooling the North and Baltic due to naval warfare (2_16), (2_17) could also produce a long distant effect, e.g. in the Pacific region, which may look like as belonging to an El Niño. It is critical to regard the El Niño of 1939 as a prolonged event until 1942. If there was no such prolongation then the Broennimann’s theses on El Niño relevance for arctic war winters 1940-42 in Europe  would require further explanation, as well the fact that other severe winters occurred outside the event period (e.g. 1916/17, 1928/29). Further discussion in this paper shows that the making of the arctic winter 1939/40 came from regional conditions leaving little if any role for the Pacific to intervene in high Northern Hemisphere weather affairs. Excellent weather analysis by the NZZ on 14th January 1940 came to the conclusion that the origin of the cold wave across Europe could be traced back to the first week of December 1939, even though the actual process had started much earlier. Though the NZZ assumed the change in weather conditions to have taken place since the 1st week of December 1939, a high pressure kept Atlantic cyclones away from North and Middle Europe latest since October 1939. To prove this theory this paper will depend to a large extent on daily weather reports of German meteorologists at the Seewarte in Hamburg during the first four war months, viz. September - December 1939. While discussing the cooling of Europe in late 1939, a brief assessment of the general conditions during the year 1939 will be presented in the form of weather analysis clippings by meteorological services in respect of North Europe compiled by the author. This is to show that the climatic conditions during the first eight months of 1939 until the end of August had been exceptionally normal without any significant deviation. This means that the Second World War started on a ‘clean sheet’ of normal climatic conditions. While weather conditions were almost average, the spring again had a succession of warm spells interspersed with brief cold spells. After a warm and sunny start in early June, the summer was comparatively sunshine-free with an early autumn, with the exception of a warm period in August and early September. As in previous years, November was very warm. There were, however, very few gales. There was a notable above average rainfall in the South-eastern districts and below average in the North-western districts. Rains, far in excess, occurred in the Southeast. Actually, in October 1939 Southeast England recorded excess rainfall of more than three times the average and November recorded twice the average. German meteorological analysis for the months January - June 1939 notes a weather with a tendency to be mild and partly too wet but mentions nothing special. During the months of July and August 1939, the weather in Northern Germany was regarded as too warm and too wet. A summary for September indicates that the month was a little bit too cold in the southern one-third of the ‘Reich, and it was by far too wet from the upper and middle Rhine area towards Silesia (Schlesien). October was colder for the whole of the ‘Reich’ but extremely wet in the Southern part and dry in the North. November was generally too warm and too wet. December was generally too cold, but it was too wet only in Saxony and Silesia. The start of the year 1939 was marked with mild winter weather with low wind cyclones and excessive rain. Spring months witnessed changing pressures with partly dry spells. The summer months were dominated by a low-pressure moving northeast, which brought along high precipitation to the Southwest of Sweden, in particular. Warm and dry summer weather appeared in August, when a high pressure dominated, which lasted through September. Then the weather became wetter and wetter with storms, which are usually rare during the season, becoming more frequent. October, however, was characterized by several highs consequently making the weather relatively cold and dry. During the remaining months of the year there was a rather large number of lows, carrying along precipitation as well as storms. The last week of the year was marked by some lows – moving southeast – and brought along an exceptionally strong cold for the whole country. 1939 was a very rainy year. In Zürich it was the year with the highest precipitation for the last thirty years. The sunshine was one third less than expected. For the last fifty years no other year had witnessed less sunshine as 1939. Only January and April had normal sunshine; farthest away from normal were May and October, which reached a degree of cloudiness like never before. Compared with these extremes the average annual temperature was quite normal. As to the 75 year average, the average of 8.8°C of 1939 even showed a slight increase in the level of warmth by about one tenth of a degree. Still, 1939 was the coldest among the past six years. General weather conditions in Europe are determined by the cyclonic west-wind climate, which is dominated by the movement of maritime air masses from west to east, most significantly during the winter season. German meteorologists called it west-wind-drift (WWD) until the 1940s. Particularly sensitive to the WWD are Northern Europe, north of the English Channel, the Alps and the Black Sea. Since sunshine is less during the winter months, heat stored by the ocean or seas contributes to Europe’s usual mild winter weather conditions. For cyclones generated in the middle of the North Atlantic, south of Iceland, the common axis for going east would be via England, the North Sea and Northern Germany. As long as the flow of maritime air from the Atlantic is moving this way, the climate in Western Europe is moderate and the flow of continental air is reduced. This common climatic mechanism was considerably reduced in respect of all countries bordering the North and Baltic Sea in late 1939. Although the North Atlantic was not less active as usual, the low-pressure systems moved less and less along the common WWD. According to the Neue Zürcher Zeitung (14 January 1940) the meteorological conditions for the early cold in January 1940 could be traced back to the first week of December 1939. (A) Indeed, on the 8th of December the situation was conducive for an early winter and presumably cold start into the winter season, when a solid high-pressure bridge stretched from Scandinavia to France (see map above). Such a situation cuts Middle Europe off from the weather making process in the Atlantic. Further details: (A) above page 25. It took only two weeks for Europe to enter into a very severe winter. The weather chart of the 21st December 1939 (see p. 35) showed that a high pressure with 1,033mb had taken position over Central Europe (Kassel), with three cyclones on the periphery; one the off Lofoten (970mb); one in the middle of the North Atlantic, south of Iceland (980mb); and one off the coast of Porto/Portugal (1,010mb). The corridor via the North Sea was definitely closed for some time. The ‘too cold’ water body formed a barrier preventing Atlantic air to flow along the common WWD. That this process had started much earlier than in December 1939 is discussed hereafter. This discussion is based on the daily weather analysis of the German meteorological service, the “Seewarte”. Deviation from average? – September 1939 – First signs? 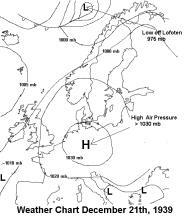 During the first few days of September 1939 the weather in Western Europe was influenced by a high pressure over Scandinavia. Except for a mixed front line (warm and cold) running from Bergen, Jutland, Basel, the Adriatic Sea, Malaga and out into the North Atlantic on September 5, the dominance of the high pressure remained until September 9 when a cyclone passed Scotland, entering the North Sea (September 11-13). The movement of the cyclone from Jutland, through the German Bight to the coast of the Netherlands and then to Brussels seems to have puzzled the analyst as recorded in his assessment on September 12th and 13th. At least, he spares no efforts to explain this event. What this cyclone may show is that the WWD still remained functional two weeks after the war had started. Actually, the cyclone had been located south of Iceland on September 9th (1,005mb), Northwest off Scotland’s coast on September 10th (1,005mb), moving via the Northern North Sea to Jutland (1,000mb) on September 11th. ‘Normally’ the cyclone would have moved via the Kattegat to the Southern Baltic, unless a significant temperature difference between the land (cold) and the water of the North Sea (warm) had attracted it to take the southerly route. Remark: It could well be possible that the cyclone’s movement was determined by military activities in the Helgoland Bight and the laying of large mine fields in the Middle of the North Sea (called: ‘Westwall’). Further details: (A) Sea mines, 2_14. 19 September 1939; Cyclonic activities over the Polar Sea area (Nordmeergebiet) are intensive. The west-drift in the North will consequently move more and more to the South. 23 September 1939; With the advance of Atlantic air into Middle Europe a more forceful cyclone can develop along this channel (Rinne) which could extend its influence in the Middle Europe later. Remark: The last two extracts show the high expectation that cyclonic activities in Middle Europe will resume soon, which did not occur as indicated in the following extract one week later. 29 September 1939; General weather situation towards the end of the month clearly reveals changes indicating the end of the Indian summer spell which leads to a time of increased cyclone frequency in Europe. In the weather chart this is indicated by a decline in the Northwest-European high–pressure area (anticyclone), which dominated the general weather for a long time. This high, that usually is located far to the East (cf. the weather situation a year earlier) is responsible for the well-known late summer period of fine weather, now pushed so far to the West that Germany lay at its Eastern rim and thus got into the cold Northern stream which was interspersed with disturbances. 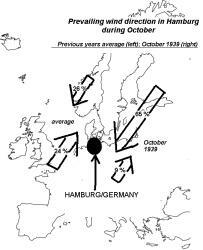 13 October 1939; Along with a peripheral low, the first effective gust of maritime air has reached Northern Germany. A continuous WWD, however, cannot be expected yet. 19 October 1939; A broad high-pressure bridge has formed between the Atlantic and Scandinavia high. Again this results in a weather situation like those, which have been witnessed frequently before during corresponding months, viz. a high-pressure zone moving from the Atlantic via Southern Scandinavia to Russia, with low-pressure disturbances to the North and South of it. 23 October 1939; Usual weather is changing now and the high pressure bridge which links the Azores high with the West Russian high is broken up. A transition to a west wind situation is on the verge of the German seas. 28 October 1939; Since a high pressure bridge from Middle Scandinavia to Scotland remains, a further stream of cold air from the Nordic Sea area (Nordmeerraum) is cut off. Hamburg reported winds from the North-Eastern quadrant on almost two thirds of the dates observed (33% easterly winds out of 65%) while North-Eastern winds accounted only for a quarter (26%) of several previous years’ averages. Otherwise most frequent direction of the wind – South-West (24%) – accounted for 9% of all cases. Thus the observations at this station alone show what the weather charts of an extensive area will obviously indicate as well. Remark: This is a very strong and clear indication that huge air masses moved towards the North Sea, presumably caused by unusual high evaporation in this sea area. While the water of the North Sea was ‘stirred and turned’ the ‘steam’ rose upwards into the sky, causing air to flow in from Easterly direction, which subsequently prevented low-pressure systems to travel along the west-wind-drift channel via the North Sea and Central Europe into the eastern hemisphere. Data for the next four weeks are mixed. Four statements made during the month may illustrate the situation as seen by the analysts who thought them worth mentioning at that time. 5 November 1939: It appears that now – like in many earlier years – a WWD with lively cyclone activities will begin to move over Europe at about the middle of the month. 14 November 1939; It seems that a mainly sectional circulation is going to take over in the general weather situation: its pressure field will be characterized by a long high pressure zone – Azores –Southern Germany –Southern Russia – and WWD-like turbulence activity in the North of these regions. 29 November 1939; West Siberian high is slowly retreating towards the East thereby allowing the disturbance coming from the West to penetrate still deeper into the regions of European Russia. 30 November 1939; A very distinct west wind weather situation rules over North and Middle Europe. In summary the expectations of the weather analyst for ‘lively cyclone activities’ did not materialize. Seawater changes by devastating war machinery were not imaginable by weathermen then. · Remark: The first few days of December see attempts by rather weak cyclonic storms to reclaim their common path of travel from the Atlantic to the Eastern hemisphere. By 7th December 1939 a high pressure forms near Aachen (West Germany/Belgium), stretching to Norway, the ‘last straw’ that led to a severe winter condition, as analysed by the Neue Zürcher Zeitung, and reproduced above, (NZZ, 14 January 1939). Four further excerpts from the daily Seewarte analysis demonstrate how the ‘Seewarte’ civil servant on duty judged the developments. 1 December 1939; Quite distinct Atlantic frontal zone of the last few days is disintegrating. 8 December 1939; It appears that the influx of warm air from the West is stronger than the retreating stream of cold air so that the high pressure bridge might stay, although the English frontal zone is currently progressing towards the East ever so slowly. 19 December 1939; A high-pressure ridge stretches….(etc). These conditions, however, are not likely to exist. The same pressure ridge is attacked from two sides and has gained more than 10mb in the past 24 hours…. 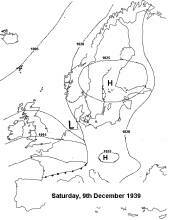 21 December 1939; A high pressure area that yesterday lay over the Northern coast of Scotland, lies today over Central Germany with a central pressure of 1,034 mb. The heavy fall in pressure over the Polar Sea area (Nordmeerraum) has produced a low there. Since this date the West Wind Drift was defiantly barred from entering Western Europe. At this stage it might be worth noting the research made by Drummond for Kew Observatory (London) in the early 1940s, that of the prevailing wind directions in South-West England during 155 winters from1788 to 1942 only 21 had easterly resultants whereby the few winters 1814, 1841, and 1940 had resultants from NE to ENE, meaning northerly than East. Another little number of winters since 1841 (1845,1870,1879, 1891, 1895, 1904, 1929) had prevailing SSE to ESE. With the exception of the winters 1801 and 1804 all of these 21 winters with predominant easterly winds had a temperature below average (40,1°F; 4,5°C). While eleven of the above winters had means between 34°F and 36°F, only few westerly resultants had means lower than 37°F, these being 1820,1830,1847,1855 and 1886. In summary it can be established, that winter 1940 clearly played in the league of the Little Ice Age, being the only winter with wind from the NE quadrant since the end of the Cold Medieval Age Period. That had little to do with distant El Niño but a lot with the just started war at sea. 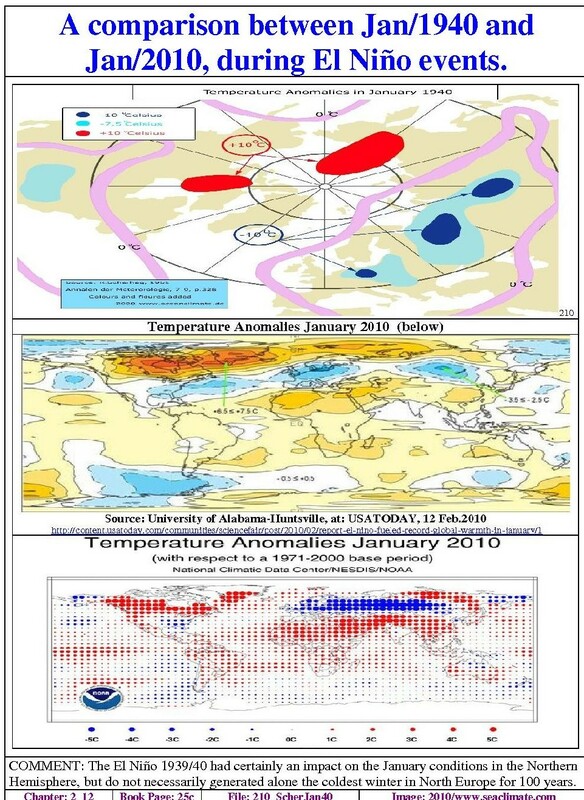 Further details: (A) Winter 1939/40, 2_11; (B) North Sea cooling, 2_16, and Baltic Sea cooling, 2_17. Development of severe weather conditions during the first war winter of 1939/40 was not an erratic incident by nature. This could be well illustrated by various comments on the missing “west-wind-drift” by meteorologists responsible for the preparation of daily weather charts. In the absence of usual weather behaviour, their task of making reliable weather forecasts was complicated. Direction and intensity of maritime air from the North Atlantic are particularly relevant in this matter. The extreme cold wave in early January 1940 had hardly started when the Neue Zürcher Zeitung explained on 17th January that its formation could be traced back to the first week of December 1939, observing that high air pressure stabilised over Middle and Northern Europe, which kept Atlantic cyclones away from the continent. That was exactly what the people from the German weather service had been concerned about since October 1939. But their analysis on 29th September notes that they realised a significant deviation in weather from average condition. The high pressure for an Indian summer in Germany had moved extremely far away to the West. However, Germany was not on the Western border of the pressure system, but on the Eastern border. The move of the high pressure so far to the West stands in close relation with the churning of the seawater areas due to naval war in Northern Europe’s seas.